Starting up a cleaning business. Promotion and Getting Clients. Now that you know how much it costs to start a cleaning business having read Part II of our guide, it’s time for you to decide the type of cleaning business you’re going to start. Residential or commercial, working straight from your home or going big, focusing on carpet cleaning or window cleaning or maybe offer a variety of services all together. It all comes down to your skills and budget. As we saw before, you can start with as low as 400-600$ or try and hit the market with a larger investment. Every business start-up can get messy if you don’t have a PLAN. So take a notebook and right down the things you need to do in the order you need to do them. This will help you greatly. Trust me, you don’t want to get overwhelmed. Prior to starting a cleaning business try and get as much information on the field as possible. You can try reading books and manuals, training guides on how to clean, watch videos and tutorials etc. To get started we recommend the Ultimate Cleaning Business Package as well as a few others you can find on PART V – Resources. Before getting into anything else, you must decide whether you’re going to act independently or start your cleaning business as a franchise. Franchising has both ups and downs. The advantages include nation-wide advertisement, training and support till your business runs smoothly and profitably. They provide with almost everything you need from starting your business to getting clients, their systems, patterns, forms, contracts, everything. However, while franchising has some advantages in the beginning, you’ll find that in the long run, once your business begins to roll and you start feeling financially secure, having chosen to work independently would provide with more profit and potential growth. On top of that, starting as a franchise will require a much larger investment than starting independently. In a sense, you can learn everything a franchise will teach you if you dedicate some time reading courses and guides found either online or even in your local bookstore. We will cover that in Part V of this guide. First thing you need to do is come up with a catchy, memorable name for your cleaning business. The name alone can play a very important role in your success due to word of mouth doing its magic. Once you come up with a name for your business, make sure you visit a domain name registrar and buy the equivalent domain for later use. Then you need to register your business name by visiting the local County Clerks Office. You may choose to start as a sole proprietor or an LLC. Keep in mind that you can start as a sole proprietor and then convert to an LLC as you see fit. You may want to have an expert fill in the forms and do all the paperwork for you to avoid any mistakes in the process. You’ll have the chance to review our recommendations for such services in Part V (Resources and Education) of this very guide. 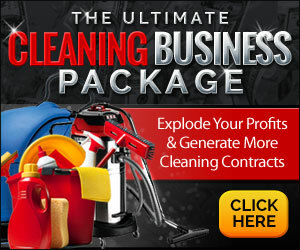 This is part of starting your own cleaning business. You don’t have a choice but to open a business bank account to comply with the Internal Revenue Service’s rules and regulations. Basically, this is needed to keep your business finances separated from your personal finances. You won’t be receiving any interest from your business checking account, however, having a healthy business bank account goes a long way establishing credit for your business. Which will make applying for banking products (loans etc) much easier. Make sure that you visit several banks and compare their fees to make sure you’re getting the best deal. You need to get liability insurance to protect yourself and your business from mishaps. For example, if one of your employees slips and falls down, even if you have a “wet floor” sign in place, you may be hold liable for his injuries. This is why you need liability insurance. If you own a vehicle that you use for business, you must have insurance for it. You don’t want to be involved in an accident and not having the vehicle under insurance. Especially if one of your employees was driving. This type of insurance protects you from theft basically. While you may never need to use it, having bonding insurance is a true asset when trying to book clients. You will come face to face with clients that will prefer a bonded cleaning business to a non-bonded if they are given the chance to compare. Which most of the time, they will. So while this is not mandatory, it’s definitely recommended. Your business card shall be one of the primary ways of promoting your business at early stages, building relationships with your customers and taking advantage of the most powerful form of advertising, word of mouth! Thankfully, you can get thousands for as little as 20$. Make sure you always carry some cards on you and never, ever forget to leave your card here and there, when you’re done cleaning. You may want to consider giving some to your friends to spread them across your neighborhood faster. This is the most important part of the deal, right? Nothing else matters at this point but getting clients. Early in the beginning, you may face some difficulties getting the number of clients you’d hope for, or not. It highly depends on your marketing skills, social circles and market acknowledgement. In any case, you WILL get better as time goes by. As always, you can speed up the process by teaching yourself some marketing techniques and procedures. This is why we’ve written Part V of this guide, to help you get all the information you need and achieve your income goals by improving your skills in every aspect of your entrepreneurship. Now, let’s take a look in some marketing techniques you can apply in your cleaning business to get your first clients. This might be obvious but there are a few things to take into consideration. If you have friends who are small business owners and need cleaning services or if you happen to know families that need house cleaning or even if you have friends who have friends of their own that need your services… talk to them! It’s the easier way to start because you’ll be coming with references from friends and, let’s face it, there is no better marketing than that. Make sure you present yourself as an expert in your field and never beg for work, never look desperate or needy. Even if you’re exploring friendly territory, same rules apply as if you were talking to a total stranger. You don’t want others to think that they do you a favor hiring you or providing you with their contacts. You must be getting every job because you deserve it. This falls under the same category with friends and your current social circles, so to speak. However, friends and their friends are not anywhere near enough to build the connections your business needs. It’s just a start. Networking is defined as making connections among people or groups of a like kind. To make connections work for you, there’s a few simple things you can do. In a nutshell, you must be present in your local community’s events. You must attend as many as possible in your spare time in order to get people to know you, to be aware of your presence. This really goes a long way into making it as a business owner. You may want to attend regional or federal events as well as your business grows. Understand that it’s only people calling the shots in matters of your concern. Like deciding whether or not they need a cleaning service and who to hire. Try to find out who these people are and establish a relationship. Call them for their birthday, call in once every month or two to see how everything’s going, if they are happy with your services or need something improved (if they have hired you already) and so on. You may try cleaning a poor family’s house. People just love stuff like that. Just make sure the community is aware of your actions. Don’t neglect your partners. Host a dinner once a year for all your business associates as a thank you for their trust. Most likely, you are going to love using Craigslist. You can get a great deal of customers and most importantly, there’s no cost in doing so. Using Craigslist is very easy and it shouldn’t take more than 60 minutes to get the hang of it. Other than being free, Craigslist is a great way to advertise your business regionally. Very few internet assets achieve good results in doing that. You should know that 90% to 97% of customers today search online for local businesses and Craigslist ranks very well for local search terms such as “cleaning services #enter city name#“. So if you want people to find you, advertising for free on Craigslist is an obvious, easy choice. You are allowed to post in NINE major categories in more than 500 cities across the globe. Most of them are totally free (major cities apply some fees but it’s under-priced). Make sure your contact information is easy to find in your posts, put them on top preferably. If you have a website of your own, make sure you link back to it. Keep your posts up to date. You don’t want your customers finding out about offers that are no longer in place. Make no grammatical or syntax errors. This can greatly damage your reputation and you easily lose trust and reliability. If needed, check your text with a proofreading service. No fluff! Go straight to the point. Nobody likes people that rumble on with no reason at all. Unless you have something really important to say, keep your posts as simple and sort as possible. Make sure you post your ads in relative categories. A good place to start would be “Services” category. 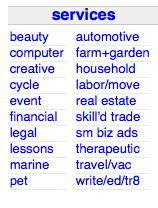 Now you may want to list your business (depending on what services you’re offering) in more than one sub-categories. Choose “household” if you’re offering house cleaning services and “skill’d trade” if you’re offering commercial cleaning as well. Just to name a few. Use an attractive title for your listing: “Affordable Housecleaning Services”, “High Quality, affordable Cleaning Services”, “Professional Cleaning. Low Cost. High Quality.”. You can come up with your own, those were just to give you an idea. About the ad itself, you will want to keep it sort. Maybe 500 to 600 words. Have a small introduction, who you are, what you do, how well you do it. Use bullet points to list your services, people tend to read those much more than they read paragraphed text. Scout for your competitors ads, see what they’re doing and try doing it better. Reading some marketing courses will greatly help you write a converting sales letter to post on Craigslist. That’s just something I made in a rush. You can do a lot better. However, it’s clean, it’s easy to follow and it has a selling point. TIME. You will find that saving time is one of the main reasons people hire cleaning businesses. Knowing that, it’s usually a good idea to challenge your potential clients to think about saving some time and spend it on things like playing with their children, going to watch a movie or something. If they can afford your services, It’s almost guaranteed that they will think about it. Some will turn into contracts for you. Job done. This is definitely something you must consider doing, sooner or later. It will greatly help with your business branding and gaining authority. But that’s just one piece of the puzzle. What a website is really good at, is generating leads for your business. You’ll want to build a professional website. Using free website builders found online won’t do the job. If anything, they can only harm your business authority. Don’t worry, you can get a simple, yet professional and good looking website for 300$ or something like that. If you need help building a stunning website that doesn’t cost a fortune, you can always hire one of our experts by filling the relative form in Part V – Resources. … to name just a few. This will require both on page and off page SEO. Which means that someone will have to optimize your content on your site as well as promote it using various methods in order for you to rank for your targeted keywords and start generating leads. You can print T-shirts with your logo and communication details and distribute them. You can have pens, notebooks, calendars and a variety of give-away items promoting your brand name. People use such items because they need them daily. After done cleaning for a household or a business that hired you, pass them your business card and ASK them if they are entirely happy with everything you’ve done so far. If there’s even the slightest complain, be polite, tolerant and discuss it with your customer. Try to compensate each time. This shows you care and you always seek to improve. Exceeding your client’s expectations goes a long way into having that customer refer more clients to you. As simple as it gets, most people overlook Direct Mail. Well, don’t. Have a sales letter professionally written, print some envelopes with your business logo and mail it to potential clients in your region. If you’re not confident in writing a sales letter yourself, you can always hire a copywriter to do it for you. You can use the same sales letter for your Craigslist posts we talked about before. That’s it. Following the above steps should get you some clients to get the ball rolling. Or maybe even more. Coming up next. How to manage and expand your business for maximum profits. PART I: Learning about the Industry. Profitability. Qualifications. Hi Denise and thank you for your comment. Currently, we only operate this website on informational basis. We do not offer phone support or coaching. However, you can use the contact form at: http://howtostart-acleaningbusiness.com/contact/ and let us know what we can do for you; what is exactly that you need. Hi Felix. As described above, the first thing you need to do to start your own cleaning business is to come up with a name and register your business with the state you want to operate it in. Check our state-specific guides for more information. The second step is to one a BUSINESS bank account with a bank of your choice. Your fourth step is to get liability insurance and if you can afford it, bonding insurance as well. You will also have to pay the Worker’s Compensation Insurance as well. 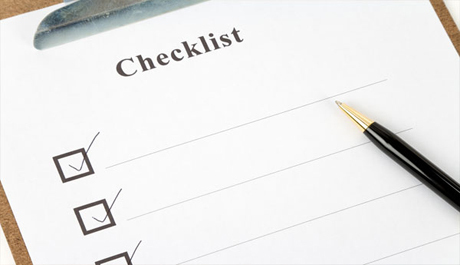 You must check your state’s record-keeping requirements and comply to those. You must also report new hires and re-hires to your state’s officials. Depending on your state, there could be some additional steps and more regulations applicable such as environmental practices. For example, you must inquire for proper locations to base your business (some locations may be off limits). Previous post: Office Cleaning Business. Start your own.